yeah for you on your patterns!!! I'm making one for a swapping buddy! Your bags are STINKIN cute! (Thanks...like I needed one more project before Christmas...LOL) I really must get down to the shop and do a little retail therapy...You are right about Tammy. She is a sweetheart. Congratulations!! So exciting! They look fantastic! You know enough famous people to last you until Portland! The bags you designed are adorable! I'm so excited for you! Oh my goodness! I am speechless! I don't remember the last time I had so many compliments! Pam, what a blessing you and Elizabeth have been to me and all of my girls. You guys have been such great friends to us already, I'm looking forward to getting to know you both even better!! Might mean I have to make a trip to California again one of these days. And you will naturally want to come to Chicago for a visit right? Just not in the winter!! Hope you are still enjoying the bubbles and fruit snacks!! See ya soon! So much fun you had!!! 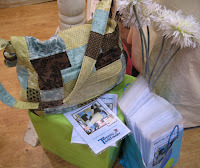 Love that patchwork bag. Very cute! G and I were in the shop yesterday but you weren't there. :( See you soon! If you think Tammy's booths are great, you should SEE the shop. 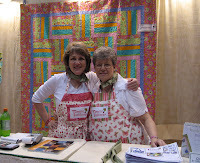 Oooh, and I see one of the aprons I sewed on the maniquin!!! heheheh. I LOVE your new purse pattern, as a matter of fact, I may have it downstairs right now waiting for me to make it up into a shop sample for Ms. Tadd -- speaking of which, to my sewing machine! 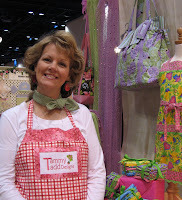 I get such a kick out of Tammy's pattern names... Patch Me if You Can, Plaid About You, Daised and Amused... is just too clever and too funny!